conducted for this ESIC Delhi JE vacancies. Online applications registration will be starts from 16-11-2018 to 15-12-2018 through the official website of www.esic.nic.in. 52 JE Civil vacancies and 27 JE Electrical vacancies are in this ESIC Delhi recruitment exam 2018. Diploma or Degree in Civil or Electrical Engineering qualified candidates are only eligible for applying this ESIC JE recruitment. Written Exam for ESIC JE vacancies will be conducted for 200 marks. 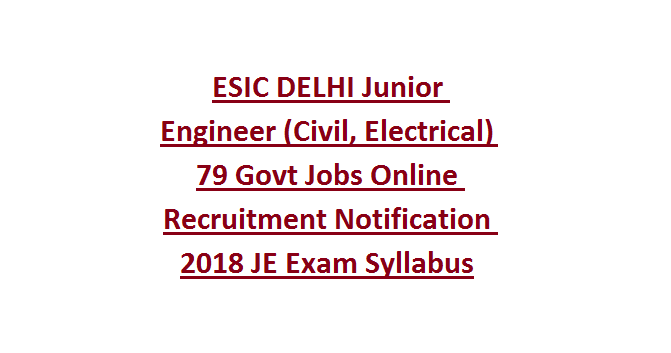 More details about this ESIC Delhi Junior Engineer recruitment exam pattern, JE Exam syllabus, JE online application form link and other posts are given below. 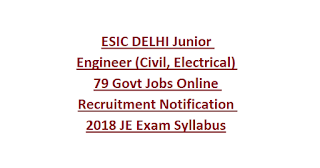 There are total 79 posts in this ESIC JE recruitment 2018. Age limits cut of date is 16-12-2018. Upper age limit is 30 years for these JE posts. Candidates must have qualified Diploma or Engineering Degree in Civil or Electrical Engineering Discipline. Two years of professional experience is required for applying this JE vacancies. Selected candidates will receive Rs.35000/- per month. An objective type computer based written exam will be conducted for JE vacancies recruitment in ESIC. Written exam will be conducted for 200 marks. Written exam consists of two parts. Apply online for this JE posts of ESIC through official website of www.esic.gov.in. Last date to apply online is 15-12-2018. Exam Pattern and JE Exam Syllabus, JE Admit Card and other detials are available in this website only.